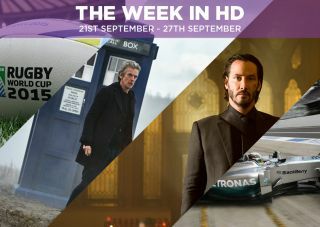 The Week in HD - John Wick, Doctor Who, Rugby World Cup and more | What Hi-Fi? When his beloved dog is killed by a gangster's son, former assassin John Wick goes on a severely stylish and efficient murderous rampage. It could easily be so silly, but John Wick doesn't faff about, the action and momentum of the story never falters, the characters are compelling, and the underground assassin's world created by the film is just plain cool. Just watch the trailer. The music, cinematography and the action are all great - it's Keanu Reeves doing what he does best. We like Keanu Reeves. We like John Wick. One of the biggest surprises of all of DC's comic book TV adaptations was The Flash, which managed to be a lighthearted and fun first series - a distinct counterpoint to its darker and broodier sister show, Arrow. We meet Barry Allen (played by Grant Gustin), an orphaned forensic investigator who develops superhuman speed after a radiation+lightning incidient. He uses his newfound 'metahuman' power and CSI skills to track down other metahumans (with increasingly silly code names) causing chaos in Central City. Along with multiple crossovers with Arrow and a bold time travel attempt, Barry also meets the man who was responsible for his mother's strange death. Headliners v Bookworms. Two teams who lost their first round contests get another chance to reach the quarter finals. All they have to do is find the connections between seemingly random things. Highlights from last night's TV awards, with Andy Samberg hosting a night of glamour and revelry as we find out which of our favourite TV shows and actors won big. Week in HD favourites such as Game of Thrones, Mad Men, House of Cards and Veep are all up for multiple nomations. Want to step back in time to a world of glamorous clothing and glamorous cars? Then you really must get yourself to Goodwood Revival. You won't even need a Tardis. Tune in to see the highlights from the world's only vintage motor racing show, with cars, outfits and atmosphere straight out of the post-war era. Legend - the recent take on the Kray twins played by Tom Hardy and Tom Hardy hasn't gone down that well. For an alternative, and arguably better, bipoic about the brothers who ruled London in the 1960s, this unflinching portrait of their rise and fall is a must-see. Patisserie. It's the quarter finals on Bake Off, so it's time to tackle choux pastry. After making 24 identical cream horns, the bakers are tasked with creating technically perfect 'mokatines' - fiddly squares of genoise sponge filled with coffee buttercream and decorated with two types of icing. But it's the showstopper that sounds absolutely bonkers: choux pastry eclairs filled with creme patisserie, iced and decorated with buttercream, which must all defy gravity and be arranged in three tiers - all standing upright and not looking messy at all. Good luck. These north London teams have suffered contrasting fortunes over the past week. Arsenal fell to successive defeats (and lost three players through red cards) against Dinamo Zagreb and a Diego Costa-led Chelsea, while Spurs are on a high, winning two games with new signing Son lighting up White Hart Lane. It's a Carling Cup tie and there's pride at stake for both teams. Expect a tight contest. New Zealand v Namibia. Facing mighty world champions would make anyone quake, but the Namibian team seem rather chipper about their first world cup match against the All Blacks. It'll be an entertaining night. Dara O Briain hosts the comedy news show, with guests James Acaster, Gary Delaney, Zoe Lyons and Josh Widdicombe on the panel tonight. Running with the rugby theme, this drama based on true events is worth a watch. Set before and during the 1995 Rugby World Cup in a post-apartheid South Africa, President Nelson Mandela (played by Morgan Freeman) enlists the help of the national rugby team, captained by Francois Pineaar (Matt Damon), to unite the racially segregated country. The Target. You probably know someone in your life who tells you, every six months, that you must watch The Wire. Today, we're that person. So here you go: start from the very first series, where a Baltimore cop attending a trial for a drug dealer in a case that has far-reaching consequences sets the scene for an incredible TV show about the drug-dealing Barksdale organisation, the police detail investigating them, and everyone in between in Baltimore. England v Wales. The championship continues with one of the biggest matches to date. Both teams are desperate for a win, as a loss here would spell trouble with the mighty Australia also in their group. The Witch's Familiar. The Doctor is trapped on the planet Skaro - the heart of the Dalek Empire. With no Tardis, sonic screwdriver or Clara to help him, will he be able to survive the wrath of his eternal enemies? And with his greatest temptation before him, will he be able to resist? The Japanese Grand Prix. Only the most dedicated fans will be up at silly o'clock in the morning for this race, but the Suzuka circuit is a favourite for drivers and fans alike for a reason. The figure of eight design, the chances of overtaking and the high-speed corner 130R corner that rivals only Spa's Eau Rouge all make for some excellent racing. But it's a poignant one as well, as it was at last year's race that Jules Bianchi suffered a crash that would later take his life. It's autumn. Friendships and loyalties are tested as we come closer to the end of the era, with Lol facing an impossible task, Shaun taking a trip down memory lane, and Kelly's downward spiral going out of control.